Xiaomi’s CEO has revealed that the Mi Mix 2 smartphone has entered mass production. Shortly thereafter, leaked renders and a live image of the bezel-less smartphone surfaced online. Xiaomi CEO Lei Jun posted some teaser photos for the Mi Mix 2 this week, according to GSM Arena. 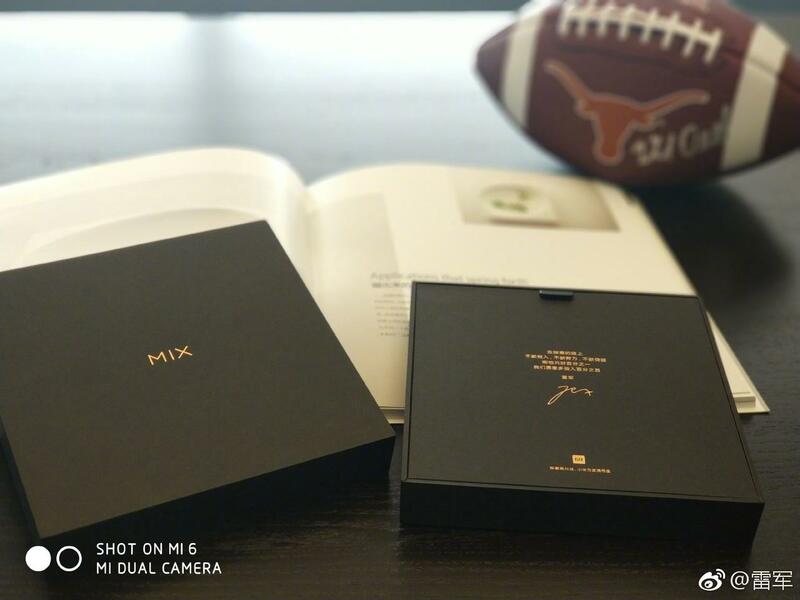 First, the CEO shared an image of what appears to be the retail box of the Mi Mix 2. In keeping with the minimalist design, the retail box is nearly all-black with the gold “Mix” logo being the only thing present on its top. Inside the box, there seems to be a short thank you note which is likely covering the Mi Mix 2 itself. Xiaomi also released a couple of teaser images for the Mi Mix 2, which are hilariously depicting the phone as being nearly invisible when turning on the camera. This is the company’s way of showing how thin the bezels are on the Mi Mix 2, and how it makes it look like users aren’t holding anything when taking photos. Xiaomi has also released a bunch of Mi Mix 2 promo images which are once again touting the bezel-less design. Jun also confirmed that the Mi Mix 2 will have a 17:9 aspect ratio, the same one that’s on the original Mi Mix. The Xiaomi CEO revealed that the company had a six-month long dialog with Google about the aspect ratio of the original Mi Mix since Google prefers the 16:9 aspect ratio. Google says that the 16:9 aspect ratio would improve compatibility with Android phones. The aspect ratio is already the standard for all smartphone. Jun said that Google eventually agreed with the taller aspect ratio of 17:9 for the original Mi Mix. Now, with LG adopting the 18:9 and Samsung using the 18.5:9. In a way, Xiaomi paved the way for other manufacturers to adobe a taller aspect ratio because of the origina Mi Mix. Shortly after the Xiaomi CEO shared these details, a leaker on Weibo published a couple of renders of the Mi Mix 2. One of the photos has confirmed that the smartphone will house the front-facing camera on its ultra thin bottom bezel. There’s been a lot of questions regarding the location of the front-facing camera for the Mi Mix 2 since early leaks suggested that the device won’t have any room for it. As for its other sides, the Mi Mix 2 appears to have no bezels. By these renders alone, it does look like Xiaomi will have the most impressive handset at least in terms of screen-to body ratio. Right after the renders leaked, a live photo of the Mi Mix 2 also surfaced on Weibo, as first spotted by Playfuldroid. The picture shows the smartphone on somebody’s hand showing off its “tri bezel-less design” in full. The photo seems to be one of Xiaomi’s promotional materials. The Xiaomi Mi Mix 2 will launch in China on Sept. 11, just a day before Apple’s iPhone 8/iPhone Edition event in Cupertino, California. The Mi Mix 2 is expected to be powered by Qualcomm’s Snapdragon 835 processor, with 6GB of RAM and 128GB of storage. The Xiaomi Mi Mix 2 is rumored to cost 3,999 Yuan or around US$599 for the 128GB model. There’s also a rumored 256GB model which might cost $749.